I’m no longer making any of these tools. Compass Bicycles is selling an updated version of the Frame and Fork Alignment Gauge. I have no intentions to offer the fork fixture anymore, but have left this page up for existing users. When used with a height gauge and a surface plate the Frame and Fork Alignment Gauge allows you to easily check that the dropouts on a bicycle frame or fork are centered with respect to the dropouts, and that the dropouts have the proper spacing. This gauge can check 100mm, 120mm, 130mm, 135mm, and 145mm dropout spacing. The mounting tang is 8mm tall and works well with the clamp that comes with most height gauges. These are made out of 1/4″ thick 6061 aluminum on my CNC mill, and I check each one to make sure that it is within specifications. The font has changed since these photos were taken, but the shape is identical. This is too large for my deburring machine, so it is delivered as it comes off of the CNC mill and may have sharp edges. The height gauge shown in the last photo is not included. 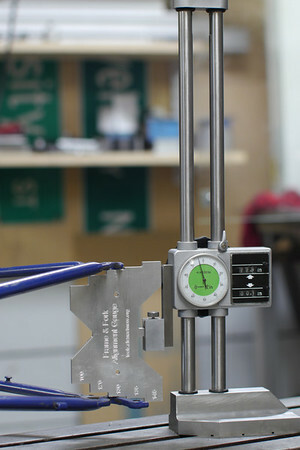 Hahn Rossman has posted a photo set of one of the prototype gauges in use. I’ve also posted a blog entry showing how these are made. I can ship these in a padded envelope to any US address for $5 or anywhere in the world for $14. I’m exploring cheaper options for international shipping. Credit for the basic design comes from Martin Tweedy. This fork fixture kit builds quickly into an accurate fork fixture that also has a lot of features that make it convenient to use. There is a lot of brazing access, making it easier to get your torch into every corner of the crown. The toggle clamp makes it easy to install and remove the fork. The axle clamp uses one screw for vertical adjustment of the axle along the fixture, and another screw for rotating the axle in the clamp. The blade support quickly folds out of the way to increase brazing clearance. Having just built three forks on one of Alex’s jigs last week, I must tell you it’s a fine tool. Easy to load, and un-load, with the fork parts during assembly. My build process requires a lot of this parts in parts out business, so anything that makes this easier is welcome. My other fork jig takes a bit more time to load and un-load, so it just seems to draw out the tedious parts of the process. Kudos to Alex for a smart design at a very nice price! The kit includes the unique and hard to find parts necessary to build the fixture. You will also need to purchase the extrusion, T-nuts, and some joining plates from 80/20 and small fasteners from a hardware store or other source. It is designed to work with an Anvil front dummy axle, which you can order from Anvil Bikes. A full list of necessary parts is included in the assembly instructions. It can be assembled in under an hour using only a hacksaw, flat file, and allen keys. hows the fork kit coming? Can I buy plans if it will be a while? I have a bridgeport and can fab a few things, but was hoping to buy your kit. It is almost ready, I have two more parts to make. I”m doing a slight redesign on the dummy axle holder to make them faster for me to make and more accurate. Mostly my day job is slowing me down from making a lot of forward progress. somewhere on your sites I left a comment and question about shipping kits to Germany. Anyway, now I would like to buy the Frame and Fork Alignment gage. Do you still have one available? How can I pay for it? PayPal? Can I get a fork jig kit from you? Thanks! Alex, any chance you”ll make more of your alignment gauges or fork jig kits? I used your gauge at Dave Bohm’’s school and well, it is the business. I”d love to have one if you fire up another batch. Same goes for the jig. I used Dave’’s Anvil but I can”t justify that cost for one bike a year as a hobbyist. Hi Alex, will any more Frame and Fork Alignment Gauges be available this summer? I was just directed to your page via Velocipede Salon. I”d be interested in picking up some of your stuff when its back in stock. Is there an email list or do you have an idea of when you”ll restock? I was wondering if you”ve manufactured any more alignment gauges ? I”ve used a friends and find it perfect for the job . I would also love one of you alignment gauges. A very nice simple tool. I”d willingly plop down for one if you would kindly make a few more. Thank you so much for all the great information and inspiration. Please let me know if you complete another batch of tools (alignment gauge primarily). I need that Fork & Frame gauge. Please let me know when they are available. Also interested in an alignment gauge if you”ve got any on the horizon. Please get in touch. Thanks! I expect to have an announcement on this in late August or early September. I was wondering if you could tell me the 80/20 profiles you used for your arctos clone jig? That fixture is beautiful and am going to make something similar. Thanks! Hi. Thanks for your website, the rack building info is invaluable. I”m interested in your fork kit! Will check back in August for that announcement. Did I miss the announcement , interested in both the fork jig kit and the alignment gauge. They are all the 15-series profiles. The fork kit is unlikely to be coming back. 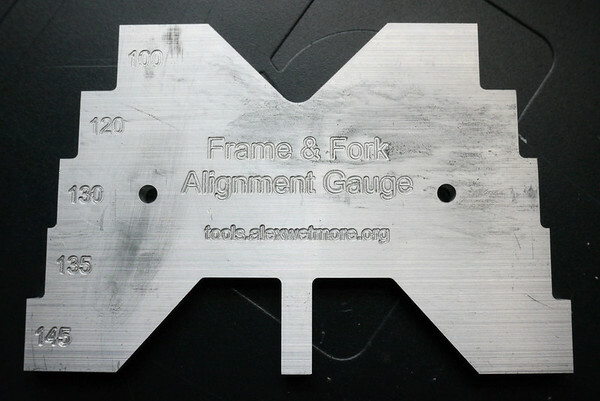 There should still be an announcement sometime soon for frame and fork alignment gauges. Greetings from New Zealand. I”d very much to be kept in the loop should you decide to release more Fork Kits and Alignment Gauges. Thanks for your effort in posting so much here. Hey there, will you be making any more frame alignment gauges? Yes, we are just moving slowly. We”re going to be producing them on a new machine, and need to get that machine up and running first.